Today, millions of people cross the Sydney Harbour Bridge each year. It is one of the main ways we have of crossing the beautiful Sydney Harbour from one shore to the other, and its existence is so much a part of life for Sydneysiders that few of us stop to consider how people crossed the Harbour before the Bridge was built, let alone how people moved their vehicles from one side to the other! Before the Harbour Bridge, there were two ways of moving vehicles from one side of the Harbour to the other. 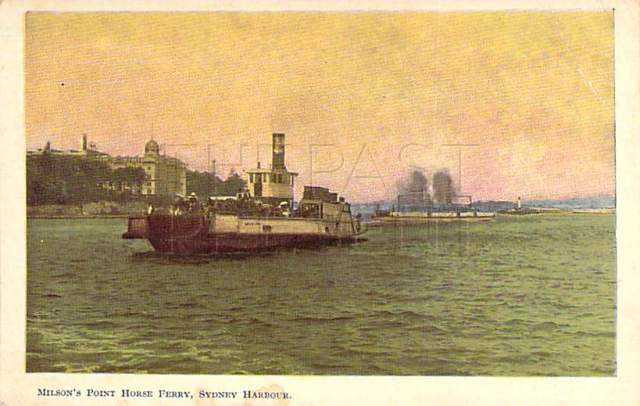 One was to head inland to Bedlam Point and use the punt which crossed the relatively small distance of water, and the other was to use one of the horse ferries operating on the harbour itself, like the one shown in this postcard (posted in 1908). When the Harbour Bridge was opened in 1932 there was no longer any need for the ferries and the wharves were demolished and the boats put to other use. The remains of only one of the horse ferry wharves can still be seen, off Hickson Road in the Rocks. 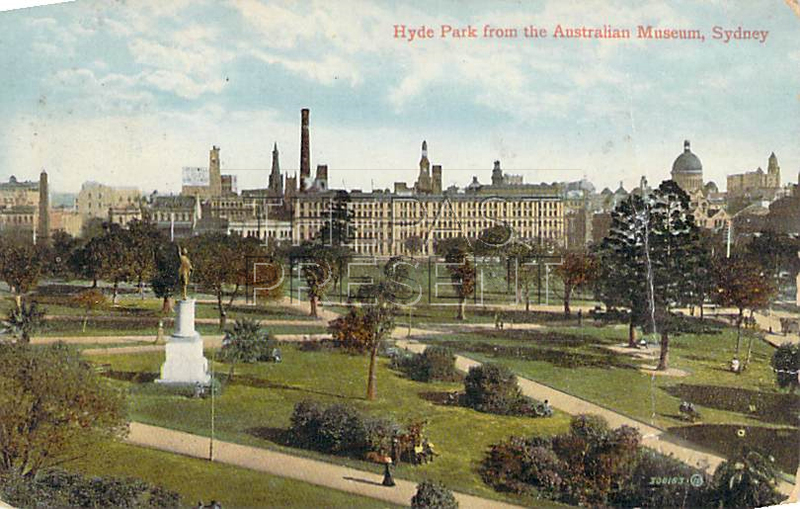 This image, from an early 20th century postcard, shows Hyde Park evolving into a calm, open space, perhaps even a retreat from the busy working life of the nurse (probably from the nearby Sydney Hospital) captured in the photo. 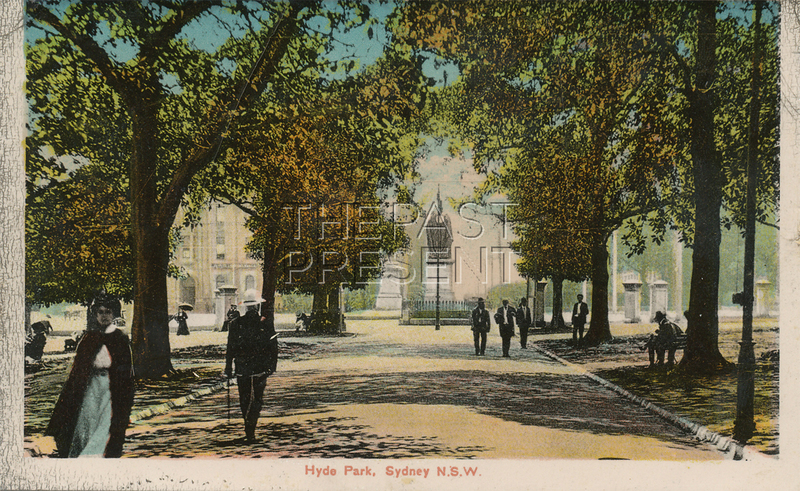 In the 19th century, Hyde Park underwent a complete change, leaving behind its early role as a mustering point for convicts and soldiers and becoming the predecessor of what we see today – a tranquil, green sanctuary. Of course, the predecessor of Hyde Park was not calm in any sense of the word. Although Governor Macquarie set the land aside in 1810 as a common, naming it after Hyde Park in London, the area soon became Sydney’s first recreation and games centre. It was used for a variety of sports, from cockfighting to cricket, but one of the most important and famous features of the park was a racetrack. Slowly, as the century wore on, the park began to be used for more peaceful pursuits, more in line with what we would recognise today. This photo, from a postcard sent in 1926, shows Captain Cooks Memorial in Hyde Park. The memorial commemorates the man who discovered Australia, reminding passers by of the early history of Australia under European Settlement. 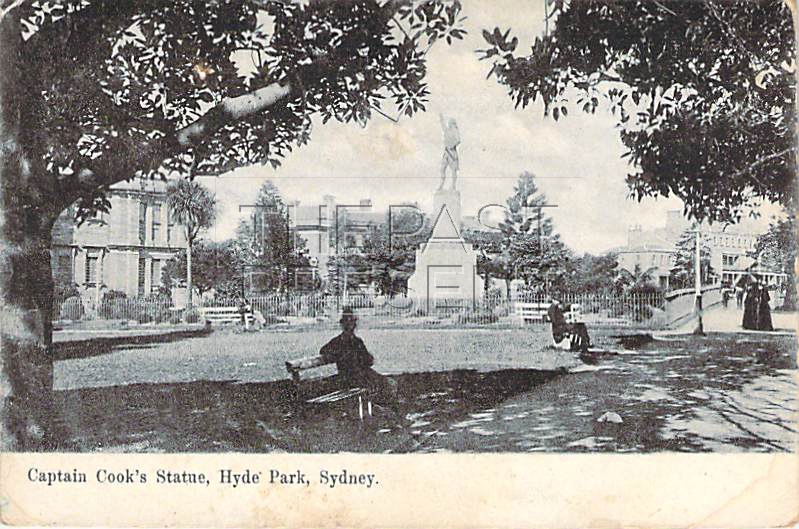 Hyde Park has always been an important feature of Sydney, even before the Park was formally set out. By the late 1700’s, not long after Europeans first settled Australia, the area was used as an assembly point for the soldiers. The aim of the area was to provide a place where soldiers could be quickly assembled in the event of a convict uprising. It was also probably the site of a battle between the Aboriginal inhabitants and European settlers for control of the land around Sydney. Come back next week for the next installment in the Hyde Park Series. This photo, taken from a postcard posted in 1914, shows Hyde Park beautifully set out as a formal parkland and garden. It wouldn’t be long though before much of this was gone! When the underground railway was put in during the 1920s, Hyde Park was all but destroyed. The railway tunnels in this area were mainly put in using excavation from the ground level of the park, and much of the park was, as a result, ‘excavated’. In 1927 though, the park was given a new lease on life with a competition for a new layout and design being launched. The competition was won by Norman Weekes and it is largely his design which we recognise today. Come back next week for the next installment of The Past Present’s Hyde Park series.